The Information Commissioner's Office (ICO) said tackling the issue was a "high priority". Typical messages claim recipients are entitled to money, promise to write off debts or find a loan, or suggest accident compensation can be claimed. But in many cases, the products they are selling can actually make people financially worse off. The ICO said it was investigating several cases at the moment, and had identified certain companies to target. 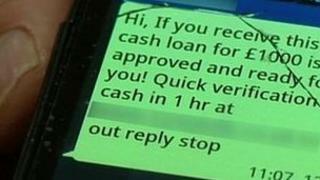 The Consumer Credit Counselling Service (CCCS) charity is running a campaign against unsolicited texts, and believes the messages cynically target vulnerable people. Sarah Stocks, from Plymouth, said she started to be bombarded by texts after enquiring online about applying for a loan. She decided not to go ahead with the application, but by then, her contact details were already being used. "I got [texts] all the time, sometimes four or five a day. You know, you're lying in bed reading, about to switch off the light, and you get a text at 10.30pm. But when you pick it up it says 'Do you want a loan for £5,000? '," she said. "It is just absolute harassment. I think they have sold my details on to more companies." Many of these texts can be from legitimate companies, and come after a box is ticked, or terms and conditions are agreed to that allow the company to get in touch. But others are randomly generated, and are against the law if no consent has been given to allow such messages to be sent. These companies do not know anything about the recipient or their finances, or even if the phone number is real. If a reply is sent, the number becomes more valuable because the sender knows it is genuine. The CCCS is highlighting this issue on social networking site Twitter. It is asking people to tweet every time they get an unwanted spam text. Matt Hartley, who is helping to run the campaign, said one person received 90 messages from debt and loan companies on Christmas Day. "These companies are really preying on financially vulnerable consumers. In many cases they are offering services that could make their situations much worse. It is a really big problem," he said. Many of the texts were from fee-charging debt management companies, even though charities would help people sort out their finances for free, he said. Steve Eckersley, head of enforcement at the ICO, said the issue had been elevated to a "high priority". "Our recent survey reveals that half the population has received this type of spam texts, causing people alarm and distress. I am particularly worried about vulnerable people in the community, that they are being targeted," he said. It can be difficult to pin down who is sending these texts, because many come from unregistered pay-as-you-go SIM cards. But he said the ICO had made progress and was investigating the possibility that some cases were linked to organised crime. "We have been able to identify where these text messages have been sent from. And that is really important to us because we have been able to focus our activities around particular premises," he said. "The next stage of our investigation is to execute search warrants, and we have got several premises identified that we are going to target." After more than a year of constant texts, Sarah Stocks has finally got some peace - by changing her mobile number. "I begrudge having to do that, but I did not know what else to do. I feel really annoyed, angry at times, quite helpless," she said. The ICO said the best way to prevent companies sending spam messages was to be very careful about giving out a mobile number. But if it is too late for that, people already receiving them can take certain steps. Mr Hartley, from the CCCS, said: "Don't reply. Instead, report it to your mobile network. You can also complain to the Information Commissioner, online, by e-mail or over the phone."